Huawei P20 Pro vs iPhone X - Who wins the battle of giants? Fresh from trolling Apple and Samsung ahead of the launch of its new phone, Huawei announced the P20 and P20 Pro in Paris. The latest generation of Huawei’s P-series, the devices focus on style and design, as well as an AI-first approach. Despite six months between them, the Huawei P20 Pro and iPhone X share many similarities, with a few key differences. What are they? Let’s find out! Front or back, both phones look very similar. You might even say the iPhone X somewhat inspired Huawei with the design of the P20 Pro. Let’s get this out of the way; I don’t like the notch! The iPhone X saw the continuation of a new trend: the notch. We say “continuation” that’s because although Apple brought the notch to the forefront of the industry — inspiring a whole range of notched devices — it was the Essential Phone that bought us the first notch. Let’s get this out of the way; I don’t like the notch, especially in its current position at the center of the top of the screen. Aside from that, the Huawei P20 continues Huawei’s P-Series design language, with a little inspiration from the company’s Mate series. The most noticeable change from previous devices is the position of the fingerprint sensor. Previous devices have mostly opted for a sensor on the rear beneath the camera, but both P20 devices move this to a flatter sensor beneath the display. This fingerprint sensor position certainly isn’t new, but like 2017’s Mate 10, it feels a little awkward compared to the natural position on the back. Like the Mate 10, there’s no gesture support so you won’t be able to drop the notification shade with a simple swipe down. The P20 Pro uses on-screen keys but like previous Porsche Design devices, you can turn them off and navigate using taps and swipes on the sensor itself. I’d stick on to the on-screen keys, but to each their own. With no physical home button, the iPhone X relies wholly on a gesture-based navigation system. A swipe up from the bottom brings up the home screen, while a swipe up and hold brings up the card-like multitasking menu. Apple made the notch experience interesting by making swiping down on the left side of it open the notification shade and swiping down from the right open the quick shortcuts menu. It takes a little adjusting to, but it’s an interesting experience that feels designed with the notch in mind. Both devices also feature glass backs. The iPhone X is available in Apple’s traditional Space Gray and Silver colors, and the P20 Pro brings a spectrum of colors (literally). Apple opted not to offer any form of gold or rose gold for its flagship device, but the P20 Pro is available in the traditional black, as well as midnight blue and pink gold. The pink gold options features a small gradient which shimmers in the light, but even it can’t compare to the real hero: twilight. Call it a unicorn, a technicolor dreamcoat, or call it twilight — this color is my favorite ever color on a smartphone and it stands out from anything else on the market. If you’re opting for the P20, all four of these colors are available, as well as a champagne gold color. Call it a unicorn, a technicolor dreamcoat, or call it twilight — this color is my favorite color ever made on a smartphone. The position of the camera on the P20 Pro looks a lot like that of the iPhone X, adopting a vertical camera layout. This is a shift from the horizontal layout of previous devices — and the early prototype we played with. That’s where the camera similarities end. The iPhone X might be Apple’s most advanced camera ever, but Huawei wants to set a new standard for flagship smartphone cameras. The iPhone X features two 12MP cameras, one regular sensor and one telephoto sensor. The main sensor has an f/1.8 aperture, optical image stabilization (OIS), and 28mm focal length, while the telephoto lens has an f/2.4 aperture and 52mm focal length. These combine to allow the iPhone X to offer 2X optical zoom, as well as a portrait mode which lets you take incredible portrait shots with a blurred-out background. The Huawei P20 Pro features the world’s first triple camera and sports a 40MP main RGB sensor with an f/1.8 aperture. Beneath this is a 20MP monochrome sensor with an f/1.6 aperture, while the third sensor is an 8MP telephoto lens with an f/2.4 aperture. That’s 68MP of camera goodies is joined by a color temperature sensor and a laser transmitter and receiver (for the hybrid focus). The main sensor on the P20 Pro features a 1.55μm pixel size which is one of the largest on the market, as well as the largest sensor size on the market. The RGB sensor is 1/1.7” compared to the iPhone X, which has a 1/2.8” sensor like most smartphones. At 223 percent larger than the iPhone X, the P20 Pro should let in more light (though we’ll need to do some more in-depth testing to confirm this). Huawei claims the P20 Pro can capture four times the light of other smartphone cameras by fusing four pixels into one larger pixel. This means the pixel size is two-micron meters, larger than any smartphone ever. To help with those lowlight conditions the P20 Pro can capture photos at up to 51200 ISO, which is the highest on a smartphone right now (although Sony smartphones will also offer this soon). Very few phones have had a 40MP main sensor, and like the Nokia Lumia 1020 before it, the P20 Pro takes advantage of it to offer some impressive zoom capabilities. Huawei claims it is the best zooming performance ever on a smartphone, and from our brief test, we’re inclined to agree. The P20 Pro comes with two claims to zoom fame — the difference in focal length means it offers 3x Optical Zoom, but the 5x Hybrid Zoom works almost as well as the optical zoom. Huawei says it achieved this hybrid zoom by combining the details from the 40MP lens with the 3x optical zoom. We’re finding out more details on this and will bring you a more in-depth look as soon as we have it! Alongside the zoom and triple camera, the P20 Pro has a few other tricks up its sleeve. There’s a 4-in-1 hybrid focus system that combines laser focus — which spots objects from three meters away — with phase detection, depth, and contrast. A 4D predictive focus offers almost instantaneous focus on moving objects by predicting where they’ll move and works rather well based on our limited testing. Ultra snapshot allows you to go from screen off to capture in just 0.3 seconds. Like other smartphones, the P20 also offers 960 frames per second slow-motion capture, although it’s at 720p resolution like the Galaxy S9, rather than Full HD, like the new Sony Xperia XZ2. Huawei says the color temperature sensor allows the P20 to detect lighting in different parts of the screen and adjust the white balance individually, rather than applying just one white balance to the whole scene, but we haven’t been able to test it yet. One of the biggest differences in overall camera experience between the P20 Pro and the iPhone X is artificial intelligence. Arguably the biggest buzzword of 2018, Huawei has been trying to convince us that AI on your smartphone is the future and the P20 Pro takes a step towards demonstrating this. Unlike the iPhone X, the P20 Pro only features OIS on the telephoto lens and features no other hardware stabilization — it uses Huawei AI Assisted Stabilization (AIS) instead. AI is used to capture multiple scenes and remove the noise and movement blur generated by handheld use. It’s difficult to explain, but works well, and brings with it a surprise. Capturing photos, videos or long exposure shots at night, where even the slightest movement can result in lots of movement blur, can be a real challenge on a smartphone. Huawei claims the P20 Pro can take long exposure shots up to four seconds, all without any blur in the final shots. It sounds impossible, but the phone certainly delivered in our quick test in San Francisco. No fancy tricks or hardware features can help if you have really shaky hands, but for normal handheld use AIS delivers an interesting proposition. The AI tricks don’t stop there, either. Huawei added several new scenes to its automatic scene recognition, including dedicated modes for cats and dogs, as well as waterfalls and document recognition. Stealing a march even on previous Huawei devices, the P20’s AI will now automatically switch between different modes when it recognizes the scene. Get close to a subject and it’ll automatically switch to macro mode. Focus on a landscape scene and it’ll switch to greenery mode. Point the camera at a plate of food and it’ll switch to food mode. Show it a waterfall — even a small one — and it’ll switch to a waterfall mode, which takes long exposure shots. Huawei says its sat down with different types of photographers to understand exactly how to take the best type of picture for each scene. Talking to food bloggers helped it understand what the best settings are for food shots, while landscape and pet photographers helped it understand how to capture the best landscape or animal shot. It then applied these to its AI, so it can more quickly switch to the right preset mode. In our testing, the auto switching works near flawlessly, albeit with a brief delay (under a second). It recognized the scene and it picked the right preset most of the time. In the case of the waterfall, the long exposure shot proved to be the wrong choice as a regular photo had a much better result. This one example aside, the AI-assisted scene detection is very impressive. Huawei may have the upper hand on the rear camera, but the iPhone X wins when you flip to the front camera. The Huawei P20 Pro features a 24MP front camera – the highest on any Huawei phone to-date – with f/2.0 aperture but most of the fancy tricks and gimmicks are reserved for the rear camera. It does come with Huawei’s beauty mode to help make you more beautiful in selfies but that’s about it. Meanwhile, the iPhone X is a front-facing camera beast, and not just for the camera. That large notch up above the screen features an array of cameras used for the company’s highlight customization feature – Animoji. There’s no equivalent on the P20 Pro but Animoji allows you to record an animated message using one of the preset characters and then send it to friends or family. The front-facing camera on the iPhone X is a 7MP unit with f/2.2 aperture and thanks to the additional array which captures depth information, you’re able to take portrait mode selfies. This means selfies with blurred out backgrounds and Apple includes a few different preset filters to make the selfies take on a different look. Neither the front-facing camera or Animoji make use of the full array of front sensors, as this is saved for Face ID. Since the iPhone X no longer features a home button, it’s also missing Apple’s trademark Touch ID fingerprint sensor. The Face ID feature replaces it. It takes a biometric scan of your face at 30,000 different points, which the company says is more secure than even a fingerprint sensor. For the most part, Face ID works well but there are times when it doesn’t work at all. Several months later, it still feels like a Touch ID fingerprint sensor is the future, not face scanning. Both devices come with a few different camera modes, although they are limited on the iPhone X. Alongside panorama, time-lapse, and others available on the iPhone X, the P20 Pro also sports several modes from previous Huawei devices such as light painting, monochrome, watermark shots, and more. My favorite feature carried over from previous Huawei devices is the wide aperture mode, which lets you take a shot and customize the aperture (and therefore the amount of blur) — before or after taking the picture — anywhere from f/0.95 to f/16. They say the best camera is the one in your pocket. The iPhone X is still impressive, but the triple camera and AI features of the P20 Pro raises the bar for smartphone photography. Apple’s approach to iOS has always been simplicity first, but the design change for the iPhone X necessitated a change in approach. The removal of the home button means gestures are now the main way of navigating iOS. The gestures are rather straightforward, but for a platform that prides itself on simplicity, there’s a certain complexity added by needing to learn this. The P20 Pro brings a similar experience to previous Huawei devices and runs on EMUI 8.1 on top of Android 8.1. It offers the same AI features – through the Neural Processing Unit on the CPU — as the Mate 10 Pro and runs on the latest Android OS out of the box. Huawei’s addition of six new scenes to the automatic AI-based scene detection in the camera, brings the total to 19 scenes. The company has also brought AI to the photo gallery, as the NPU can now recognize 100 different types of images. The album will also give photos an aesthetic score using AI and organize your albums with the good photos enlarged so it looks more pleasing to the eye. Huawei has also launched the new HiAI (Huawei AI) Engine, an open framework that allows developers to take advantage of the NPU. Three different API sets that have launched; computer vision, automatic speech recognition, and natural language understanding. Though the company has no plans to use the APIs itself, Huawei’s partners have launched a series of apps taking advantage of them in China. These include automatically adding filters to photos, a voice assistant, and a shopping buddy — which brings up similar items when you touch an object in a store catalog. Huawei claims the P20 Pro comes with a new Face Unlock feature which lets you unlock your phone instantly within half a second. They say it’s 100 percent faster than the iPhone X but we couldn’t test this. Regardless, it’s just the standard face unlock feature found on Android. There’s no fancy hardware sensors and additional cameras so Face ID remains the better, and more secure, way to use facial recognition, even if it’s not as fast. Overall, the software on the P20 Pro has many elements inspired by the iPhone, but the iPhone X also borrowed many features from Android in the switch to a gesture-first approach. Which of these is right for you depends on personal preference. The P20 Pro experience should feel somewhat familiar to iOS-users looking to switch over to Android. Most of the hardware on these two devices is on-par with other flagship devices, with a few key differences. The table below shows a full specs comparison between the two devices. If numbers are your thing, peruse to your heart’s desire! Otherwise, skip the table and join us for the key differences below. The Super AMOLED display on the iPhone X is 5.8-inches with 1,125 x 2,436 pixels resolution, compared to a larger 6.1” OLED panel on the P20 Pro, which sports 2,240 x 1,080 pixels resolution. Apple’s display – which, ironically, is provided by Samsung – tops out the P20 Pro here. On Huawei’s flagship, the notch makes for a slightly more awkward 18.7:9 aspect ratio. The biggest hardware difference between the two will likely be the battery. 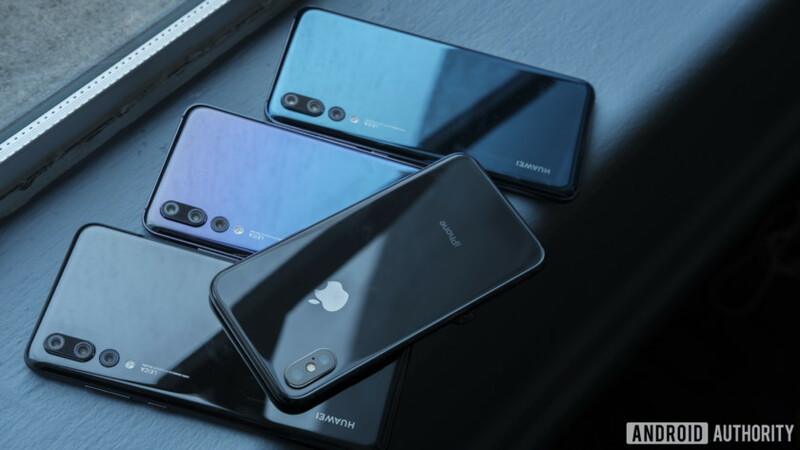 Although it’s well known that Apple gains considerable advantage in the Android vs iOS comparison thanks to its control of both hardware and software, the capacity of the P20 Pro battery is an entirely different beast for Apple to contend with. The regular P20 sports a 3,500mAh battery and the P20 Pro tops it with a 4,000mAh battery, just like the Mate 10 series last year. We’ve not tested the P20 Pro battery just yet but based on the Mate 10 Pro, the P20 Pro may offer some of the best battery life on a current smartphone. By comparison, the iPhone X sports a 2,716mAh battery — smaller than the P20 Pro (and most Android flagships). Its battery life isn’t as bad as you might think, but it leaves a lot to be desired and usually needs a recharge by early evening. 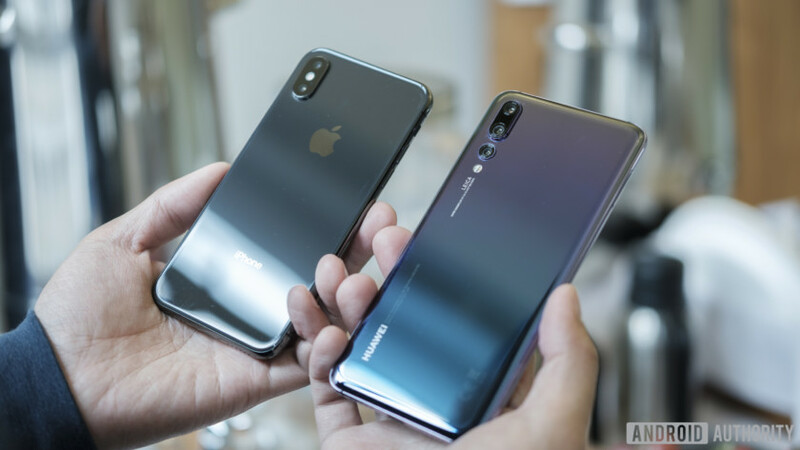 Huawei P20 Pro vs Apple iPhone X – which should you buy? Those are the main differences between the two devices, but of course, there’s plenty of similarities as well. Which of these devices should you buy is a tough question. If you’re platform-agnostic, it depends on what you are looking for in a smartphone. If the camera and battery are the most important features for you, look no further than the Huawei P20 Pro which offers the best camera and one of the largest batteries on a smartphone. If a smooth, polished experience is what you’re looking for — and of course, Animoji — the iPhone X may be for you. Which of these would you pick and why? Let us know in the comments below!